The first caveat is, paintings are never done. Every painting I’ve “finished” could have used more work in my opinion. A week, a month, or a year later, I’ll figure out how to fix something that was nagging me, or finally understand what bothered me about a painting, and I have to let it go. Every painting I have finished that I didn’t like, has found a buyer, and usually quicker than I ever imagined. There is a serious lesson in that statement. Just because I’m not happy with it, doesn’t mean someone else won’t fall in love with it. I’ve heard about artists destroying paintings they have done that they didn’t like. They didn’t want it to be part of their legacy, because it wasn’t good enough. So I did that, with one painting that I never even finished, and I still regret it. The way I see it, all the paintings I’ve done helped me to develop into the artist I am today. I destroyed one thing so far, and it was years later that I wish I hadn’t. Looking at that painting in progress taught me about mass in painting, and the folly of painting what you think is there. There may be times when you want to do that, don’t get me wrong, that’s about style, and about a conscious choice in breaking “the rules”. However, when it is an isolated component of the painting, (and not what you intended) then it doesn’t work. I fell in love with the stonework in this wall, and spent lavish care on each rock. Only when I stepped back after hours of work, did I realize that the entire wall didn’t fit in the painting. I had outlined each stone in black. Now, I know I should have given it a chance rather than seeing it as a failure. Now I look at this and I see multiple ways I could have finished this painting and made it work, so much so that I’m thinking of painting this again. 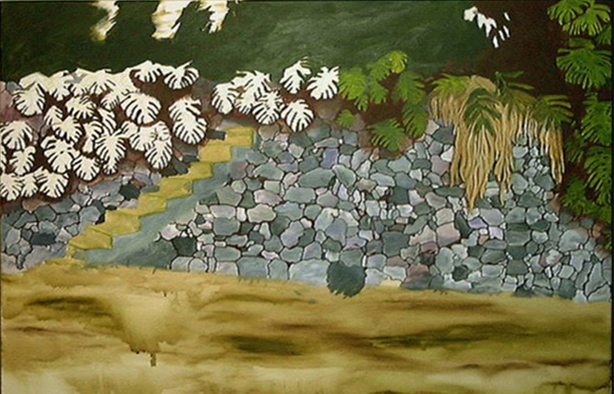 This is a rock wall in Kainaliu that was destroyed during an earthquake. How did I get where I am today with my artwork? Each painting teaches me something. Every painting is a success because any painting I do propels me forward in my craft. The more painting I do, the better craftsman I become. I would be the last to put myself on a pedestal. I don’t belong there, any more than anyone else. I’m mostly self-taught, and these paintings are all a record of my journey. This is why I still have my flickr site. It keeps me humble! Almost everything I have ever done since I started painting is on that site, and as I find missing pieces, I add them. No, flickr doesn’t go back to my childhood, just to when I began my art journey.